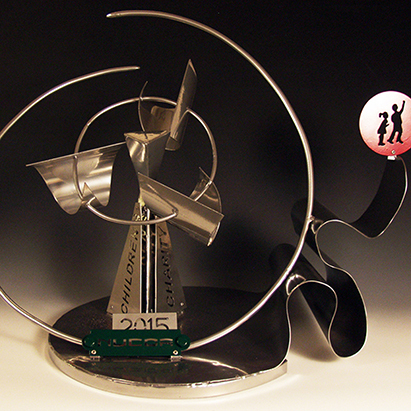 Allison Sloan’s sculpture of a golf swing for the NUCOR Children’s Charity Classic. From the February 2016 Desktop News | For the second year in a row, students have joined with associate professor Craig Wedderspoon, of the Department of Art and Art History, in raising thousands of dollars for a local children’s hospital. 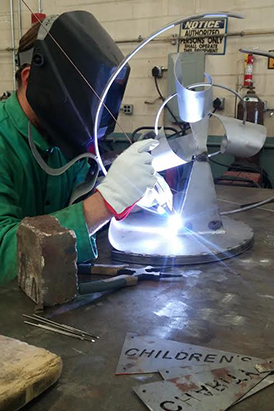 Wedderspoon and his students, including BFA senior Allison Sloan and BFA graduates Ali Jackson and Eric Nubbe, have designed, created, and auctioned off sculptures for the annual Nucor Children’s Charity Classic—all the proceeds of which go to Children’s of Alabama. This year the team’s sculptures were sold for a collective $52,000, making a grand total of $98,000 in two years. For Sloan, the project was an excuse to finally put her art to use. During the design phase of the project, Sloan was interested in motion—and as a double major in graphic design and advertising, Sloan took particular care in tailoring the work to her audience. The idea was to create the 3D image of a time lapse, but because Sloan had done only two other projects with metal prior to this one, the sculpture proved harder than she anticipated. “I knew what I wanted, but I had no idea how to make that out of steel,” she explained. Allison Sloan welding her golf-swing sculpture. Wedderspoon, who has known Sloan since he recruited her to the University in her sophomore year of high school, coached her through the process. She started in the spring, worked all through the summer, and finally finished her sculpture in the fall. Along with the team’s other works, Sloan’s final product went to auction in October and raised $10,000 for the children’s hospital. She is now working on a design for a bike rack for the Bike Advisory Committee for Tuscaloosa. If selected, her piece will be used at the intersection of 4th and 23rd in downtown Tuscaloosa.